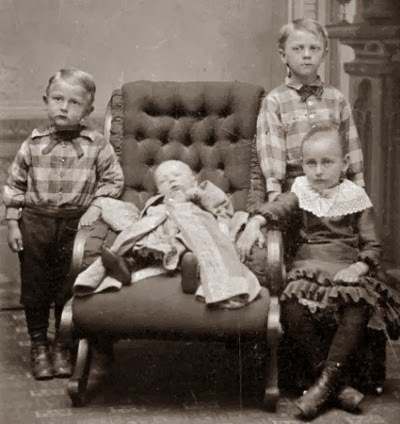 Through my investigation of Victorian medical journeys I found Victorian postmortem photography – I’m not sure that this is relevant but I was quite fascinated with the artificiality of the images and how sometimes you couldn’t tell which figure was dead. This quite bizarre practice is understandable if you consider that many families would have afforded family photographs, and where the deceased was a young child, this was an opportunity for the only photographic record of them them to be created for remembrance. Although the images are very static rather than moving, the awkwardness and quietness attracted me to them. Also the sense of curiosity and a macabre mood. 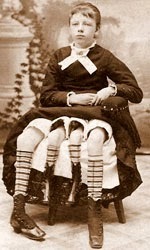 Myrtle Corbin, Four-Legged Woman belonged to ‘a class of monsters by fusion’. Multi limbed, gigantic and miniature, Myrtle was extremely popular in P.T.Barnum’s circus. 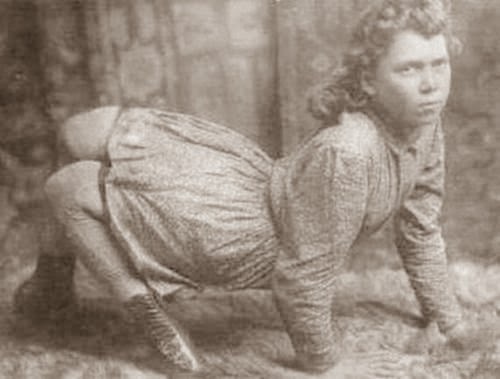 Ella Harper ‘Camel Girl’ had knees which bent backwards. I would like to use some of these ideas in my work, although I’m not sure how yet. There is the multi-limbed contorted element – I think my photos and source material are leaning this way anyway. Also the sense of awkwardness in the imagery and becoming spectacle. Curiosity and the bizarre, other and difference may also come into play.